Erstwhile, there was no regulator for the Real Estate Sector but after the implementation of RERA Act, 2016 there is now the existence of RERA authorities which will keep a tab on every activity of the builders and will penalize them if they do not comply with the provisions mentioned therein. Further, under Section 3(1) of the RERA Act,2016, no Promoters or Project can advertise the project or sale the project until the project gets registered with RERA Authority. Department has implemented the law very strictly and now Builders or Promoters must follow the law and meet all compliances without any excuse. Lately, in Gujarat, Promoters of Jaldeep Kasa advertised a project on 24/03/2018 in one of the leading newspaper for sale of their project and in this regard a suo-moto complaint filed against the builder and asked why not to penalize for violation of the provisions of law in force? In the fact-finding of the case during the proceedings, it was found that the builder submitted the application for registration of project and they only had the acknowledgment no. of the application. No Registration certificate was approved by the Gujarat RERA department and they didn’t have any RERA registration no when they gave an advertisement in the newspaper. Looking into the facts that their intention was not malicious and they had the clear intent to register the project and after having the application applied they started advertising the project. Gujarat RERA Authority after analyzing all the facts disposed of the matter by penalizing the promoters with the fine of Rs.20000/- for not having RERA registration no. on the date of event where advertisement took place. 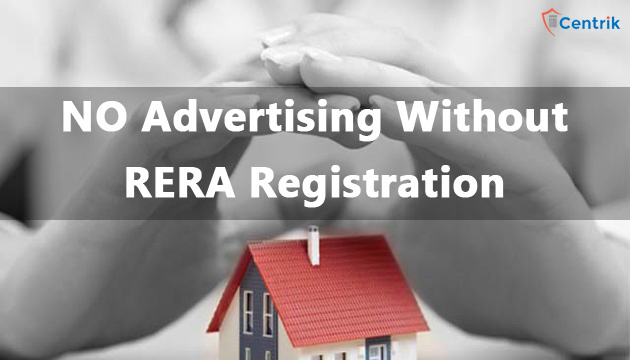 At last, we can conclude that the application for project registration under RERA shall be made for any of the projects which builder wants to sell, advertise and book for any apartment, plot or building as the case may be. Having said that, merely the filing of an application before the RERA Authority will not suffice the purpose until the promoter does not have RERA registration certificate.